From The Umbrellas of Cherbourg to the (temporary) boss of an umbrella factory — you could say that Catherine Deneuve’s long screen career has come full circle. François Ozon’s frothy comedy Potiche reunites her with another giant of postwar French cinema, Gérard Depardieu. While Depardieu is literally twice the man he was in Le Dernier Métro (1980), Deneuve here effortlessly swaps her chic image for a rather unflattering red track suit. Adapted from a successful French play of the 1980s, Potiche (it means trophy wife) begins in the spring of 1977 at the comfortable home of Robert Pujol (Fabrice Luchini) and his doting wife Suzanne (Deneuve). Robert is an irascible chauvinist pig, who treats his spouse with only slightly less contempt than his discontented workforce. We soon discover that he spends his evenings (though not Thursdays) hanging round with the tarts at the Badaboum club. He’s also on intimate terms with his long-suffering secretary Nadège (Karin Viard). Robert is clearly heading for a comeuppance, so when he’s taken hostage at the umbrella factory, it’s Suzanne who secures his freedom with a little help from her ex-lover, the Communist mayor Maurice Babin (Depardieu). This is merely the starting point for a series of revelations about the Pujol marriage and a belated realignment of the power structure in this relationship. With one of my favourite directors at the helm, an A-list cast and a retro setting, Potiche is a film I knew I would enjoy. Ozon (Swimming Pool, 5×2) is known for creating meaty dramatic roles for older actresses, but he also has a highly developed camp sensibility as he showed in the musical murder mystery 8 Women. The musical element is toned down here, apart from Suzanne’s impromptu singing in the kitchen and a rousing finale, but there’s more than enough loud wallpaper and big hair to compensate. For fans of Douglas Sirk and the earlier films of Deneuve and Depardieu there are lots of references and homages to absorb here. But let me start by saying that I don’t think Ozon’s movie is simply a shallow, shiny triumph of style over substance. Certainly, the opening scenes in which the poetry-loving Suzanne communes with nature during her jog are very stylised — so Disneyesque that they’re only missing the diminutive presence of Jiminy Cricket. If the whole film had been presented like that it would quickly have become tiresome. But though humour is never far away, Ozon’s characters do rise above the level of polyester-clad caricature. Though Potiche addresses issues of industrial unrest and sexual politics that are still topical, it’s basically a story about family dynamics — something Ozon understands well. All the actors are impeccably cast, from Judith Godrèche as the spoilt and brittle daughter Joëlle, to Jérémie Rénier in eye-wateringly tight slacks as the couple’s (impliedly) gay son, Laurent. Depardieu and Luchini really look as though they’re having a ball, too. Above all, though, Potiche is a vehicle for the mature talents of Deneuve, who proves that she can sing, dance and subvert her image as the ultimate glacial screen goddess. As a woman trying to emerge from her gilded cage, Deneuve’s Suzanne shows that common sense and a capacity for forgiveness can take you a long way both in and outside the home. As acting boss of the family business, she gradually realises that she no longer needs to have the overbearing Robert as her “boss”. Critics of Deneuve’s acting, have complained that she’s gone a long way on a combination of sublime beauty and utter blankness. I’d argue that Deneuve understands the subtleties of screen acting better than most. In the film’s most poignant scene, Suzanne and Maurice head to the Badaboum, where they hit the disco floor and Maurice tries to rekindle a lost spark. 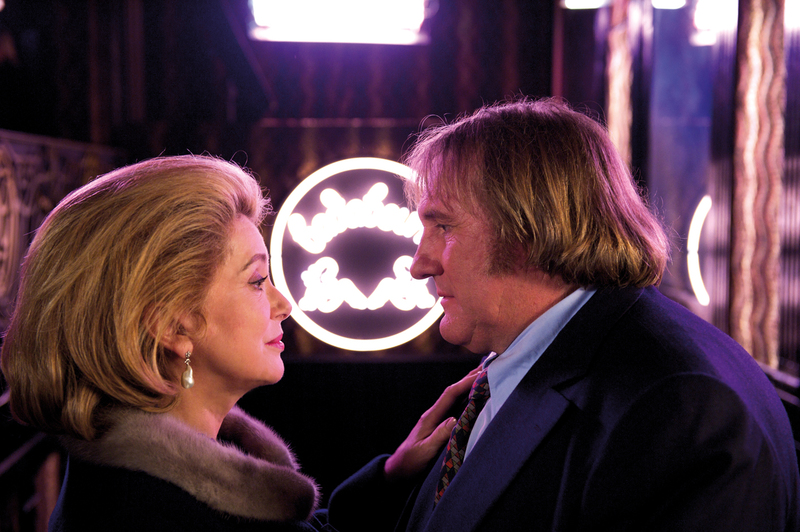 Seeing them together again, it’s hard not to visualise the young, slim Depardieu pursuing a radiant Deneuve 30 years earlier in Le Dernier Métro. The actors and the director utilise that shared history to convey the futility of trying to recapture lost youth. So Deneuve’s Suzanne gracefully rejects romance in favour of friendship. With exterior scenes that reference the style of Douglas Sirk and a score by Philippe Rombi that reminded me of Elmer Bernstein’s Far from Heaven, Ozon’s film is as much influenced by 50s melodrama as 70s politics. But if you simply want 90 minutes of expertly crafted comedy from some of France’s finest actors, Potiche is well worth seeking out on DVD. I love your reviews for their direct analysis and comments on all fronts. Thank goodness I have you to keep me informed!